Halloween Jack is a horror-filled nightmare. 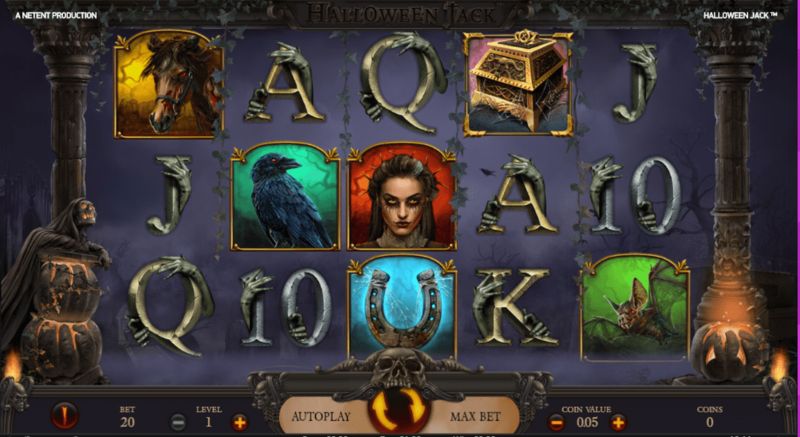 If you love a good scare and online slots uk, then you will enjoy this spooky NetEnt slot. Halloween Jack is a 5 reel, 20 payline slot with a Jack o' Lantern theme. The design is simply spooktacular with dark dreary colours and misty midnight skies. As you play, you'll hear a horrifying eerie soundtrack that may give you a fright. There are lots of monstrous rewards on offer with Halloween Jack. Features include a walking wild feature, free spins feature and Jack 'o' Lector feature. Halloween Jack is perfect if you want to play casino slots games on Halloween (or any other time of the year if you love horror). This NetEnt slot has 5 reels and 20 paylines and has a scary Halloween theme. Visually, Halloween Jack looks incredible. It's set in a dark, ghostly abandoned building where evil spirits come out at night. Behind the reels, you'll see the foggy landscape with bare spiky trees. A harrowing soundtrack plays in the background making the atmosphere even more terrifying. The symbols include all the typical card suits, ravens, bats, horse, horseshoes and a female vampire. If you're one of the players who love eerie themes, this top-rated slot game might be the one for you! The Wild Symbol - The pumpkin is the wild symbol in this slot and replaces all other symbols apart from the bar scatter and lantern. The wild only appears on reels 2, 3, 4 and 5. All wins involving a wild symbol will award you with a 3x multiplier. The walking wild feature can also be activated every time a wild lands. The Free Spins Feature - Land 3 or more treasure chest scatters to unlock the free spins feature. Here you'll be awarded 10 free spins. Landing 3 or more scatters will award you with an additional 5 free spins. You can access up to 15 free spins in this feature. Walking Wild Feature - The walking wild feature can be unlocked on any free spin. All winning combinations will benefit from a 3x multiplier. Jack 'o' Lector Feature - The lantern symbol only appears on reel 5. When it lands, the Jack 'o' Lector feature will unlock and award you with one of the following extras: Stacked Hell Hound Wild, Stacked Jack o' Lantern Wild, Expanding Death Reaper Wild. really like Halloween Jack – it looks absolutely fantastic as its crawling with ghosts and ghouls. Variance wise it’s high with maximum wins of 3,000 times your stake on every spin/re-spin/free spin. For this, you’ll need a win involving a wild due to the 3x multiplier. Or play Wild Bazaar.